This post is authored by Julia Aslamova, an online marketing specialist at SEMrush. To learn more about SEMrush, sign up for a 14-day free access to SEMrush PRO or check out our in-depth review of the tool here. You hear it in the breakroom, you hear it at your desk, you hear it as casual chit chat during meetings – everybody is talking about IPL! Well, it is not just people at work, the IPL bug has bitten whole of India and, as with any trend, it is reflected in the online behavior. 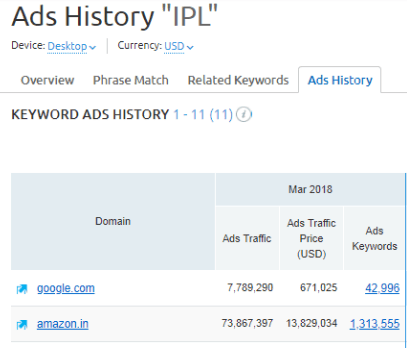 The organic search volume for keyword “IPL” is 1.8M. Yes – that is a lot, especially in comparison with other India centric events like Diwali or Holi – with the former 368K and the latter only 201K. As a marketer, you would be wondering how you can use that to get better at campaigns. Don’t worry – we have you covered. We dug a little bit deeper using our Keyword Magic tool and have uncovered 5 keyword and SEO insights that you can use in your marketing campaigns to get better results. With a search volume of 1.8 Million and having more than 22,520,00 related keywords, the IPL wave is just rising. 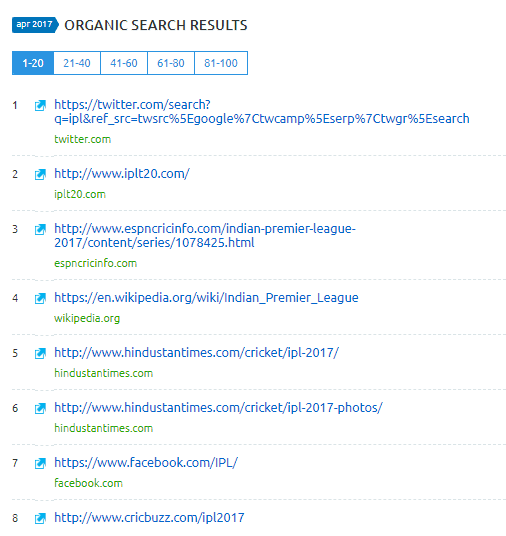 Surprisingly, despite such a huge volume, we see that it is still “IPL 2017” that has a maximum keyword volume – 2,240,000. What does this mean for you as a marketer? 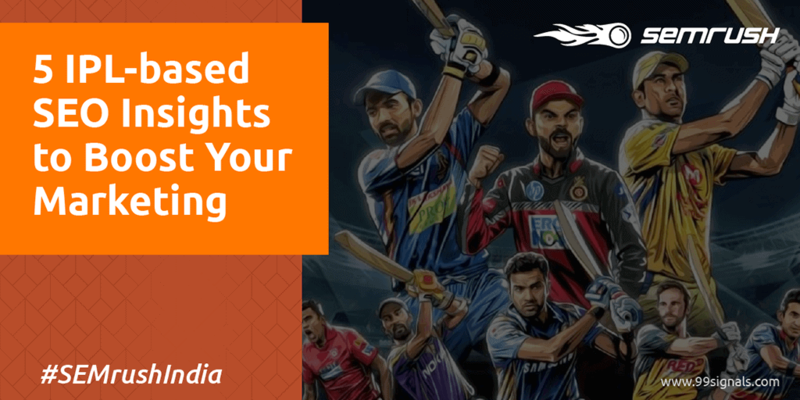 Now is the time to start IPL centric marketing campaigns and create interesting content around these keywords. It will help you rank better on the Google SERP. The usual problem with all ‘trend’ post is that it is fleeting – the content is not evergreen. So that is a lot of effort that goes for short term gains. 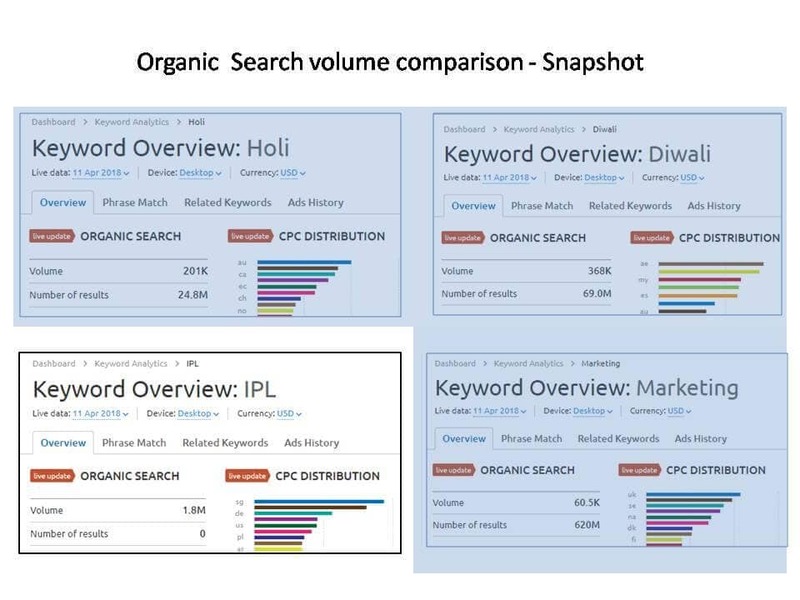 However, our Keyword magic tools shows us that despite being slightly outdated, it is still ‘IPL 2017’ that has the most volume. So, it is a good guess that like “IPL 2017”, “”IPL 2018” will have a high search volume next year – once the IPL season rolls in. Therefore, whatever content you create now, need only be modified or updated next year for better ranking and it will most certainly not be a ‘wasted effort’ for a short term impact. Yes, it surprised us too! The keyword volume in April 2017 was 823K. This year, in April 2018, it has risen to 1.8 M. The PPC experts out there would agree that such an increase in keyword volume will naturally mean an increase in the CPC as well. Surprisingly, it is not so. From a CPC of $0.14 last year, we have witnessed a drop in CPC to $0.04. Now, this could due to a variety of reasons. Google happens to be the highest advertiser for this keyword, followed by Amazon. Since Google has last years’ data, it could easily use it to create Ads with high quality score. Good quality score does not need high bids after all and so Google itself would be bidding less, thus reducing the overall CPC cost. High keyword volume, low CPC – that is every marketers dream come true. It is the perfect opportunity to start PPC campaigns around this keyword. The Ads could be for your latest content around IPL, or it could be a specific discount that you are offering for your service or product. You can experiment by running the Ads only on match nights, or even targeting the Ads only to regions which are playing that night. Eg. If it is Kolkata Night Riders Vs Chennai Super Kings, you can target your Ads only in Kolkata and in Chennai (provided it has enough reach) and thus make them more relevant. Otherwise, remember to target your Ads only to India – as IPL is a very India centric event and thus get you better CTRs and CPC. RELATED SEMrush vs MOZ: Which is the Best SEO Tool? — Updated! The usual benchmark for keyword difficulty, while choosing a keyword for your campaign is under 50% (or less). A difficulty level of more than 80% spells impossible and anywhere above 60% is not advisable. However, we are talking about a high volume, low CPC keyword here. In such a scenario, to be honest, a 64.05% difficulty level with high traffic (550K), cannot be ignored. It is the perfect opportunity for your brand to show your creativity and start ranking! Bear in mind that once other brands jump in the bandwagon (or ‘keyword wagon’?) the difficulty and costs are likely to go up. That means that you shall have to act Now, to get the most out of it. Notice that most of the Ads center towards providing information about the existing match. Clearly, this may not pertain to your brand. So you can probably come up with an interesting video Ad or contests around this keyword (that is more relevant to your brand), and start running Ads for them. Such Ads will also encourage your visitors to spend more time on site (once they click), and thus increase your engagement on page – a very good SEO win! Another aspect to keep in mind is that all Ads places had been taken almost throughout the year. For you to compete against them, we suggest you use long – tail keywords, with very high keyword volume. Also, ensure that the keyword difficulty is less than 70% – it will definitely help your ad rank in the first page. But wait! Before you rush off to plan your PPC campaigns, we have a couple of more interesting SEO insights that will highlight the importance of ‘trend based marketing’ further. We have said it enough number of times, but we need to say it again – social media activity has definite correlation with SEO and can impact your organic search. Notice that the official IPL website iplt20 ranks second – with Twitter ranking first! That is because more engagement and discussion or searches for IPL was on Twitter last year, thus giving it more authority. In comparison, Facebook despite being a popular social media channel ranked only number 7 – probably because it did not have as much engagement as Twitter. Despite that, it still ranks above Cricbuzz.com – a website solely dedicated to Cricket talk, with a domain authority of 65.62! It is high time you link your social media campaigns with other marketing activities. The buzz you create on Twitter and Facebook will have impact on your SEO and organic search (as we have just seen). So ensure that you run your Ads on these channels as well. Apart from paid campaigns, you can also explore Chat options – conduct relevant Twitter Chat with some experts with the hashtag #IPLtalk and increase engagement. For eg. If you are a digital marketing agency, you can very well call in experts to discuss winning IPL campaigns that businesses can exploit. Or it can just be a commentary on the various IPL Ads (rather like the Superbowl Ads). Another example could be sponsoring match tickets for your customers and employees and getting them to tweet about it. It has the added advantage of winning better customer relationship and obtaining more employee engagement. So, if Twitter topped the SERP last year, do you think the trend remained the same this year as well? Absolutely not. The marketers at IPLt20.com went all the way to create more brand impact. With aggressive branding, they increased their direct traffic to 46.63%, from India and have topped even Twitter this year. Organic traffic impacts SEO. 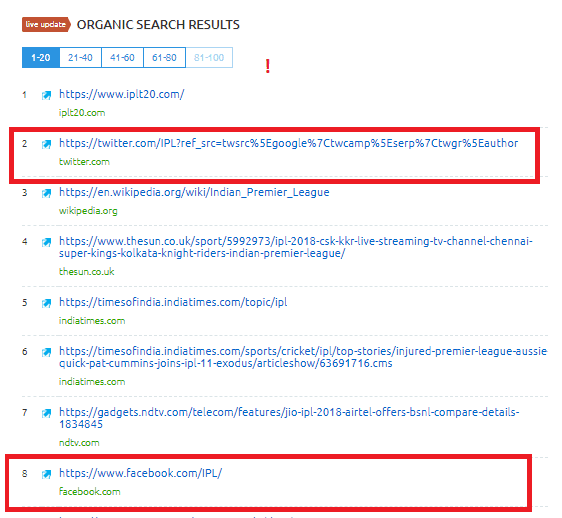 Keeping in line with the SEMrush ranking factors study we released last year, we see a direct correlation between the organic traffic and ranking for IPLt20 website. The sudden spike in traffic since Jan 2018, correlates with the jump to no.1 position on the Google SERP. So, focus on marketing campaigns that brings in more direct traffic to your site. Apart from PPC, you can use content marketing and link building to great effect to boost the number of relevant visitors to your site and thus climb up the SERP ladder. SEO is painstaking and an ongoing process, that is becoming difficult to wield because of increase in competition. Using such region/season specific trends can help you reach your target audience better and also serve them content that is relevant to them. 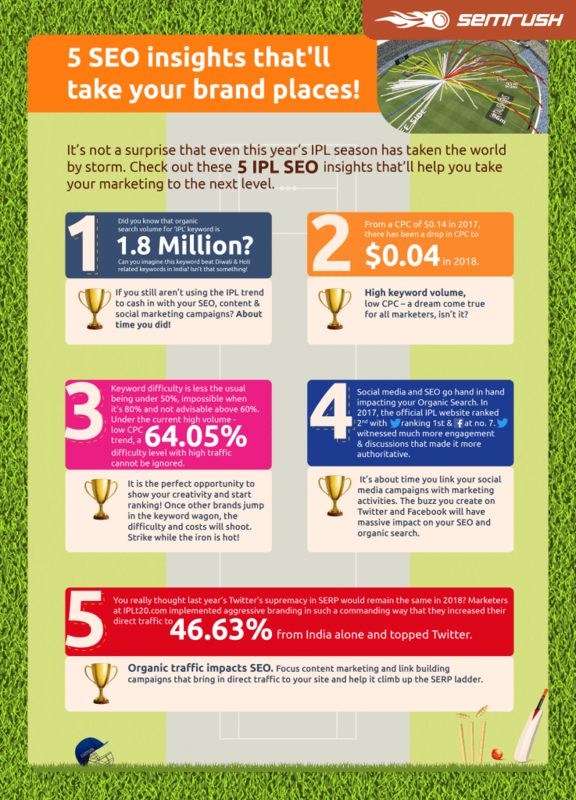 So what are your plans to boost your SEO during this IPL season? Leave us a comment and let’s talk. Julia is an Online Marketing Specialist at SEMrush.